Never in my life did I ever believe that I would be on speaking terms with a drug dealer. 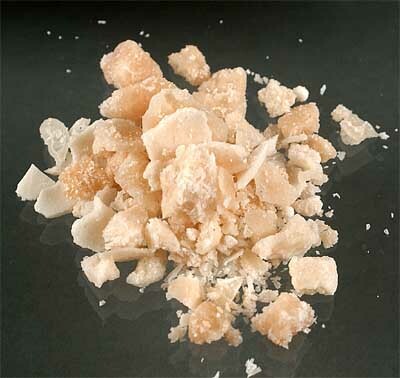 But now, after two long weeks spent in the heart of Los Angeles, I can claim to know a drug dealer quite well. Her name is Kathy and she's a 50 year old black woman living in Compton. I've been doing some soil sampling in a neighborhood near Watts (of the Watts riots) and that has been neglected for far too long. and it's poor, very poor. It's in an area of town that is dominated by a gang called F-13 and their grafittit adorns just about every building. I was walking down the sidewalk a couple days ago and noticed a trail of dried blood on the street. Evidently a gang had gunned down a young man carrying his groceries home. After the gang members departed, the man was able to get up and run down the street looking for help. According to Kathy, the incident happened about an hour after we had left the site the day before. The blood is still here, two days later. There is the house that has been riddled with bullets. Bullets that were strong enough to go through a cinder block wall and leave a hole the size of my fist. We call it the gun shot house because our team had to dive for cover after a gang sprayed the place with bullets. I'm glad I wasn't on the site that day. And then there are the shoes. I'd always assumed that the shoes strung up over electrical wires are the result of kids playing games. Not in Compton. When a gang member kills a rival gang member, he takes the dead man's shoes and strings them up in the place where the killing occurred. I'm not going to tell you how many pairs of shoes I counted at my site because it's too depressing to think about. These past two weeks have been interesting, to say the least. And it's been a learning experience. I think the hardest thing to watch was the gunshot house being rented out to a family with a brand new baby, the day after the preceding family left the premises (probably due to the trauma of the bullet spray). LA has a severe housing shortage and people are desperate for homes. 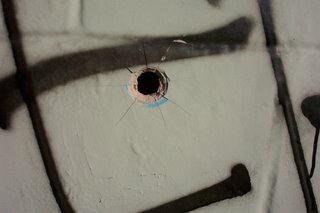 Nevermind the bullet holes. But back to Kathy. She was one of the first people to welcome us to the neighborhood and my co-workers always park their trucks in front of her house because she'll keep an eye on them and make sure nothing gets stolen. She sits outside her house on a milk crate and sells crack to passerbyers. It goes straight from hand to hand, no little baggies or fancy packaging. People give her money and two second later ythey've got rocks in hand. It's an interesting experience watching these transactions; she sits outside in broad daylight and doesn't pretend to hide the crack when she hands it over to her customers. Just another business transaction in Compton. It's hard for me to get to know the people that live in this neighborhood. It was easier for me to function at my job when the residents didn't have names or faces. Now I can't walk down the street without talking to Kathy, Mama, Mercedes, Orlando, or Jorge. Their poverty now weighs more heavily. Interesting about the shoes. Brian and I saw a pair hanging up in the Katy/Houston area (intersection of 6 and I-10 West). We thought it was odd, but I can see how it would be gang activity. It always surprised me that you don't have to go to a big city to have gangs. Bryan, TX (neighbor to College Station) is riddled with about 40 gangs, and we were forewarned to keep an eye out on our fourth graders for any gang graffiti. Did you know that the Stussi symbol (those t-shirts everyone wore in Jr. High) is the beginnings of gang graffiti?! That just floored me. And the thought of mere fourth graders being "groomed" for the gangster lifestyle makes me sick. Stay safe!!! 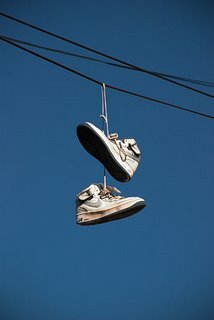 I've heard another meaning for shoes hanging on wires...I heard it means drugs are sold nearby. Just like those white crosses on the side of the road for some it marks where someone died and for others it marks where someone escaped death. As far as drug dealers go they come in all shapes, sizes and from all walks of life. Sometimes they work normal part time jobs to escape the ever watchful eyes of the government. I bet the people you've met are doing it just to make ends meet. Isn't that sad? People look to third world countries to lend a helping hand and they forget to lend a hand to those in their own country. Sonj did you know I did my training for T for A in Watts? It was a gritty, real, amazingly powerful experience. During my tenure at Gompers Middle I leanred many things including the last scene from Training Day, when Denzel Washington is killed, was based on a neighborhood down the street from my school. But I must admit that more people should visit, work, or spend quality time in Watts and other areas of similar socioeconomic hardships. It gives you a renewed perspective and a grave realization of what is really out there and how we need to help. Thank you so much for your comments. It's been a wonderful, if hard, learning experience. Danny, I completely agree with you when you say that more people should experience these neighborhoods. LA is diverse in so many ways: racially, economically, politically, and religiously (is that a word?!) and it was such an interesting and eye-opening experience that I would hope others would gain a greater understanding of people and the difficulties that they face everyday.